Tacoma, WA: Nearly 40 firefighters from Western Washington joined forces today to embark on a roughly 3,000 mile motorcycle ride in honor of the victims of the September 11th attack. Departing from the Tacoma Firefighters Memorial on Ruston Way, the group is currently making its way along I-90 and will be joining thousands of firefighters from the International Association of Fire Fighters who are riding in solidarity. The group is expected to reach New York City on September 9. One of several riders from Pierce County, Tacoma firefighter Will Yuste considered this opportunity a "great honor to pay tribute to all who lost their lives that day and to let those left behind know that the extended fire service family has not forgotten”. 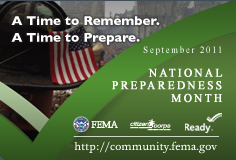 The City of Tacoma Emergency Management would like to remind everyone that September is National Preparedness Month (NPM). NPM focuses attention on what citizens should do to ready themselves, their families and their communities for potential disasters. This years theme is "a time to remember a time to prepare". You can help remember the tragic events of 9/11 by joining us at our annual September 11th ceremony and you can get prepared by completing the following. Get A Kit: Keep enough emergency supplies on hand for you and those in your care. For example, water, non-perishable food, first aid, prescriptions, flashlight, and a battery-powered radio. Make A Plan: Discuss, agree on, and document an emergency plan with those in your care. Work together with neighbors, colleagues and others to build community resilience. Be Informed: Free information is available to assist you from federal, state, local, tribal, and territorial resources. Like to stay informed? Sign up for Pierce County emergency alerts to be notified about emergencies and other important community news such as severe weather, unexpected road closures, missing persons, and evacuation of buildings or neighborhoods. Want to get involved? Consider attending a Community Emergency Response Team (CERT) training to learn about how to prepare and respond to a disaster in our community.